In honor of the launch of TNT's new L.A. noir drama MOB CITY, everyone's favorite historic tour operator, ESOTOURIC, conducted a look inside downtown's King Eddy Saloon and a rediscovered 1920s speakeasy below. "Mob City" author John Buntin was on hand as well. Watch above. 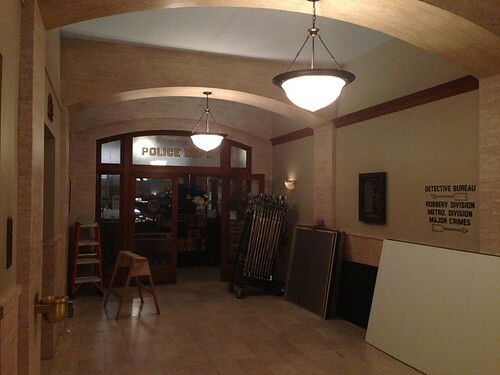 Check out a tour of the "Mob City" set (back when it was being produced under the working title "Lost Angels"), including a replica of 1940s City Hall, here. Being the serious stickler for detail that I am I have to say that in the premiere episode of "Mob City" I was tremendously disappointed by two aspects: 1) that the show created a fictitiously named Central Avenue club rather than just use one that really existed, and 2) the location of Baldwin Hills in the long shot showing the Hollywoodland sign and Griffith Observatory in the distance was wrong. Anyone standing atop Baldwin Hills looking north would see those two landmarks northeast of them (to their right) but the makers of that process shot set them to the northwest (to the left) as if Baldwin Hills was situated near USC. Like I said: serious stickler.